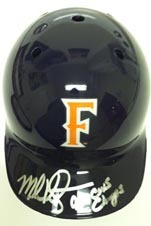 Powers Collectibles has rare Mark Kotsay autographed Cal State Fullerton 1995 College World Series memorabilia, jerseys, bats, posters, and mini helmets. Oct. 4, 2011 - PRLog -- Kansas City, MO - If you are a college baseball fan and an autograph collector, then you know how hard it is to find College World Series memorabilia. Powers Collectibles just completed a private signing with Mark Kotsay, the Cal State Fullerton 1995 College World Series MVP and Champion. Kotsay is one of college baseball's most outstanding players. We have autographed Fullerton jerseys, 24x34 Rosenblatt Stadium posters, Fullerton mini helmets, and Fullerton bats. Kotsay inscribed 95 CWS CHAMPS on each item. The jerseys are a custom jersey with name and numbers sewn on, size XL. Bats are 34" in length with Cal State Fullerton Titans engraved on them. Mini helmets are officially licensed Schutt helmets. Each item comes with a PSA/DNA certificate of authenticity and matching holograms verified on their website. PSA/DNA is the world's leading authenticator of autographs. Where do you get all of these items? http://www.powerscollectibles.com or by calling 650-888-7915. Less than 5 of each item are left. Since Kotsay does very few signings, once they are gone they are gone forever. Powers Collectibles was started by Matt Powers as a way for sports and celebrity enthusiasts and collectors to have a high-quality product available at affordable pricing. Please visit them at http://www.powerscollectibles.com.